The Best American Poetry series collects the most significant poems of the year, and this year they were chosen by Poet Laureate of California Dana Gioia. Gioia has published five volumes of poetry, served as the Chairman of the National Endowment for the Arts, and currently sits as the Poet Laureate of California. 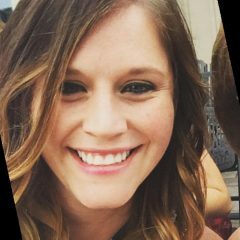 That’s a pretty classy resume! 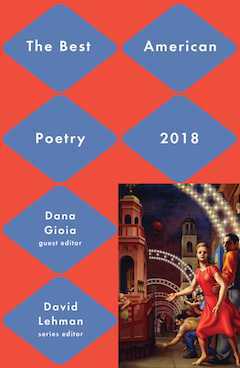 Gioia has long considered whether there is a place for poetry to be a part of modern American mainstream culture (he wrote an essay back in 1991 in The Atlantic called “Can Poetry Matter? ), and Best American Poetry 2018 stands as evidence that it can be! 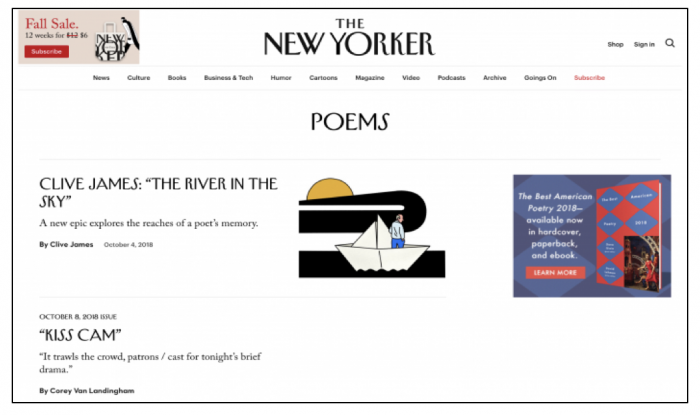 Not surprisingly, we built our targeting upon those with a passion for poetry and poets. But there were some other traits we thought would bode well with this audience, including those with a passion for art and literature, literary fiction enthusiasts, NPR listeners, writers and people who search for NY Times bestselling books. We also added in librarians and English Lit professors! Since poetry is, in fact, timeless, we also aimed to reach fans with a strong interest in both classic and modern poets, from Walt Whitman and William Shakespeare to Rupi Kaur and Bridgett Devoue. 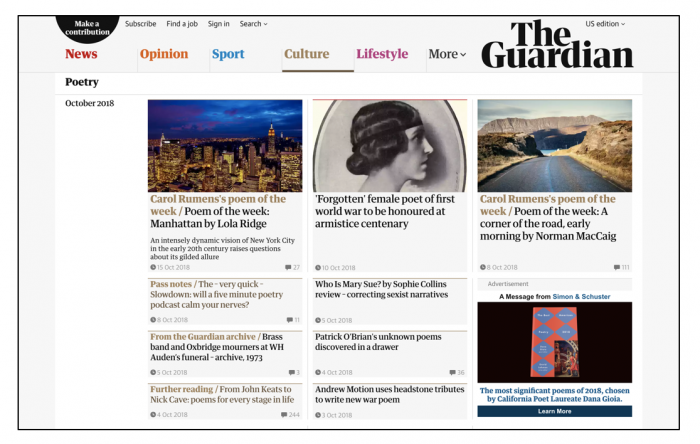 With our lexicon targeting, we targeted those reading content online that included words and phrases like best poetry books, best American poetry, poetry anthologies, and more. Doesn’t get more niche than that! Using a mix of both native and banners, we were able to reach the target audience on top-tier sites including The New Yorker, The Guardian, The Wall Street Journal, Thought Catalog, The Atlantic, Chicago Tribune, Bustle, and The New York Times. In fact, NY Times was one of the top site performers with a strong CTR of .43%! We were also able to hit some genre specific sites like Poetry Soup and Poem Hunter. The top audience traits included poetry lovers (.71% CTR), literary classics readers (1.19% CTR! ), and those with a general interest in literature and arts (.45% CTR). Overall, the campaign finished with a CTR of .21%! If you’re ready to dive into some poetry (or gift it this holiday season! 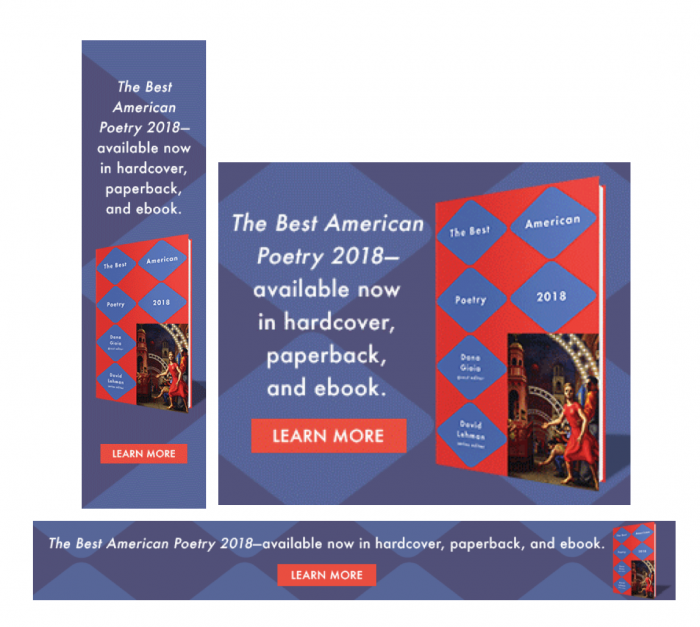 ), be sure to check out the 2018 edition of Best American Poetry here. And if you’ve got a niche book you’re ready to promote, you know where to find me → marybeth@adbiblio.com. « Happy Halloween: Reach Horror Readers!